How do you prevent your arms from getting tired? Indeed, having tired arms can make it impossible to win a boxing match. You’ll see many countering opportunities but your arms will be too slow to get there and too slow to do any damage even if it did. The answer is easy: change your technique, do some exercises, and change your fighting strategy. Arm fatigue can be the most demotivating thing in boxing. You might have all the stamina in the world, the best counter-punching skills, and even knockout power. But none of that will be any good the moment your arms get too tired to throw a punch. Another more realistic concern is not having the speed to get your punches to the target before the chance disappears. And yet even another concern is not having the energy to pull your arms back before you get countered. Arm endurance, especially in your shoulder muscles, are especially important throughout the entire fight. Being that I have long arms, I suffered a great deal earlier in my boxing journey due to serious arm fatigue. My longer arms take more energy to launch and return compared to shorter arms (especially when I miss). My arms also seem to weigh more (due to leverage and physics) when held in a static defensive position. Because of my long neck, I had to hold my hands higher to cover my head, which also affects my shoulder endurance. The struggle is very real and it took me a little more time than everyone else to learn how to really use my long lanky arms efficiently. Sometimes during the late rounds when my shoulders started burning, I lost the energy to keep my gloves up. I lost the snap in my punches. And I just didn’t have the energy to throw powerful punches let alone pull them back. I imagine it’s something like when grapplers or wrestlers get tired forearms, they lack the basic ability to grab hold of their opponent. I hate to keep repeating this mindless cliche over and over but it really does make a difference. You need to learn how to relax. It’s a mindset more than a state of being. You have to be comfortable. And you have to figure out how to be comfortable in the most uncomfortable moments. Hey now, I never said boxing was easy. in the most uncomfortable moments. Everyone’s ability to deal with pressure is different. For some, it’s simply a matter of telling themselves to be relaxed. For some, it’s a matter of getting a pep talk from their mentor figure. For some, it’s a matter of having to have boxed for years and having dozens of matches. And the truth is, not everyone will want to do the work it takes to find that level of comfort. I don’t blame them. Not everyone is naturally comfortable with getting punched in the face. I doubt anybody really is, anyway. If there’s a big tip I can give you about being relaxed…try LOOKING relaxed. In other words, when you’re hitting a heavy bag or shadowboxing, try to make it appear to outsider that you’re completely relaxed. It’s amazing how many guys show me their “relaxed punching” on a heavy bag and it still looks exhausting as hell to me. Sure, they might only be going 50% but that 50% isn’t relaxed and they will still get tired anyway. I would say it’s very common quality that many pro fighters have, where they’re able to look relaxed on the heavy bag and yet still be intense and hit hard. They are intense but it’s not chaotic, the energy spills cleanly into the movement rather than radiating wastefully from their body in all directions. The impressive quality is when someone looks fast and powerful, the even more impressive quality is when it looks like they can keep it up forever. Learn how to have breathing arms, not static arms. One of the common things beginners do that tires their arms quickly is to hold them still. Even worse is beginner fighters will hold their arms in the most tiring way possible, which is to have the gloves lifted by the face with the elbows flaring up at the sides. And then they’ll probably have clenched fists. So this works out just about every angle of the arms and shoulders and make a pair of 16oz gloves feel like 2 gallons of milk by the end of the first round. First thing you have to do is to drop your elbows and try to face your palms towards the sides of your face. The back of your hands should still point out relatively diagonal to the sides, rather than to have them point straight at your opponent. This will help relax your shoulders as the shoulder muscles don’t have to carry the arms as much in this position. The next thing you have to do is to have your arms breathe. That is the hands and arms kind of gyrate or float a little. I feel silly having to explain this because it should be something that you do natural…if I have to teach you how to do, it’ll be unnatural for sure. Think about it like this: notice how your chest rises and falls up and down naturally when you breathe? It’s not because you’re lifting your chest up and down or puffing your chest in and out on each breathe but because you’re letting your chest “breathe”. You have to do the same with your arms…let them breathe and move a little bit from their position. Don’t hold them in a stiff frame, that will tire you out quickly. The way you punch has a lot to do with how fast your arms get tired. 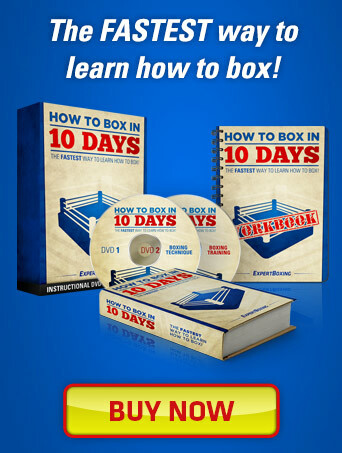 Throwing punches is probably the most exhausting thing you can do with your arms inside a boxing ring. So it only makes sense that you look to improve your energy efficiency by refining your punch technique. 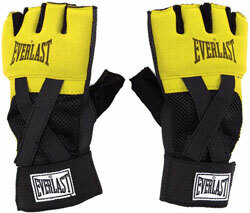 When I think of punching, I think of extend my elbows for straight punches and swinging my elbows for hooking punches. This visualization helps me keep my punches more tight and compact and connected to my core. When I think of my punches as reaching with the gloves or swinging the gloves, the punches very easily pull me off balance or swing me off balance which then requires more effort to throw and return the fist. A lot of having good endurance has to do with not letting yourself get stretched beyond your “relaxed capacity”. For example, if you throw punches that are much harder or much faster than you’re used to throwing…you will get tired easily. And the level of your “relaxed capacity” has a lot to do with the level of your “maximum capacity”. For many fighters, their “relaxed capacity” is so weak and slow that they don’t feel able to fight effectively unless they turn on their maximum capacity. And running at maximum capacity is only going to make tire quickly, ESPECIALLY when it’s your default setting. One way to increase our maximum capacity for the sake of endurance is to increase punching power (not covered in this guide). And another way to increase or maximum capacity is to increase our punching speed. This punching sprint interval drill is perfect for that. This drill is best done on the heavy bag, but is also possible on the double-end bag if you have the fine-tuned coordination for it. It’s very simple. At the last 30 seconds of each round, you throw non-stop fast punches on the heavy bag. The emphasis is PURE SPEED, and not power! You will generally be throwing nothing but straight punches during this “sprint phase”. Some coaches want you to retract the hand all the way back to your face before sending it out again. On this part, I’m ok with a fighter retracting only halfway or 2/3rds of the way. I’m ok if you only pull back the hands a few inches from the bag before sending it forward again. There are several arguments regarding this detail. The guys who want you to retract it all the way want you to exercise your muscles to get used to extending the full distance. The guys (like me) who don’t mind you retracting the hand only partial way because it allows you to punch faster and develop a coordination for faster movement. Some coaches will also want you to pick up your knees during “sprint phase” in running coronation (left knee up when right hand punches, and vice versa). Some coaches would rather you keep your feet down and activating them in the usual punching coordination (left foot heel lifts when the left hand punches). The important thing is to RESIST trying to add power. You have to focus on delivering pure clean sharp speed. Exhale with every shot! Another note is avoid doing sprint intervals longer than 30 seconds. It sounds good in theory but the reality is that your arms are probably not going to be able to deliver a full max speed for much longer than 30 seconds. It’s kind of like telling a sprinter to work on his sprint by running at maximum speed for a mile. Sure, he can give maximum effort but he’ll never hold maximum speed for all that distance. By giving yourself shorter intervals, you can work on pure speed which allows your muscles to get accustomed to firing at faster intervals. And then you’ll have enough rest to deliver another short burst of max speed again. There are many ways to go about this drill. I suggest you try all the variables and see how they affect you. focus on PURE SPEED, and not power. The speed bag is a perfect way to increase your shoulder and arm muscle endurance while also developing your coordination for high speed contractions. It also teaches you how to establish rhythm in your movements, by forcing you to flow through movements instead of being jerky (note the relax circular movement in the hand when hitting the speed bag). You have to keep your hand in motion when you hit the speed bag, that’s part of what keeps you relaxed and energy efficient. If your hand keeps stopping and moving when you hit the speed bag (as is the case with many beginners), your arm will get tired and you lose rhythm. the shoulders and triceps muscles for punching. A great way to work your shoulder endurance is to throw punches higher on the bag. More at face level, rather than chest level. It’s a common beginners to get throwing punches at the heavy bag only at chest level and then get tired in a real fight when they have to lift the arm up a little higher to hit an opponent’s head. For this reason, many coaches will tell their beginners to lift their punches higher when hitting the heavy bag. It makes a lot of sense and I recommend this advice beginner fighters as well. Once you’ve reached a certain level of comfort and no longer have the “tired shoulders” problem, you’re free to aim a little lower on the bag if it’s more anatomically comfortable for your arms and work on rhythm and other things. If you know what you’re doing, you know what you’re doing and I’ll leave it at that. The double-end bag is great for training your arms to hit a moving target at high speed, as well as to retract your hands with gloves on. There are many advantages for me to go over. First off, many fighters’ arms get tired faster when they’re forced to hit an intelligent moving target. The reason being that you’re more relaxed when you hit a heavy bag. The heavy bag doesn’t move or go anywhere and so because you don’t have to think, it’s easy to release your arms quickly and in a relaxed manner. But then when you’re in with a live opponent, your arms don’t come out as relaxed and natural anymore because you have to think and be even faster to chase a moving target. The double-end bag simulates this. And then of course, I also like that the double-end bag because it forces you to throw fast with gloves on. And you also have to work your retraction muscles when you miss. 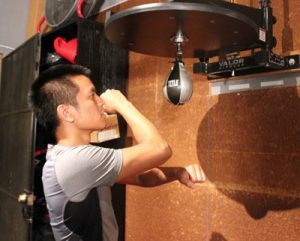 Shadowboxing is one of the best exercises that I can think of developing better arm and shoulder endurance. Because you’re also not wearing any gloves, it allows you to work your arms at higher speeds. Which is great because you’re getting used to throwing fast combinations. Otherwise, without this training, you’ll be winded simply because your arms can move faster than you’re accustomed to throwing. I have a feeling it’s part of a coordination reason as well. Another reason why shadowboxing is great is because it works your retraction muscles. Usually against a heavy bag, the bag bounces your hands back to you and so you don’t work your retraction muscles very much. And then you get in the ring and your arms get so tired when you miss because you’re not used to having to pull your hands back. Swinging a rope will definitely work your arms and shoulders from many angles. There isn’t much more I have to say about it. Do it! Don’t throw at 100% all the time. You have to hit lighter sometimes in order to hit harder at other times. Use the faster lighter punches to set up your bigger strong punches. This is a big part of boxing strategy. You never know where your opponent will be or what he will do so it’s best that you figure him out and set your punches up. Use the lighter punches as you and your opponent move around and figure each other out. Try not to throw out your bigger punches until you see some good chances. This is not only the smart way, but sometimes the only way. Otherwise you’ll be getting countered all over the place when you miss all your punches and fall off balance. Just know that it takes more energy when you miss a punch than when you land one. And the bigger punches can really drain a lot of energy and leave you in vulnerable positions when you miss. Nice article – thank you Johny! Johnny is right about staying loose and physically relaxed. Stiff, tight boxers wear down easily. A lot of fighters try to throw every single shot with KO power. That’s a great way to wear yourself out. Plus, not every punch should be thrown all-out. Some punches are used to set up your foe or like using the jab as a defensive weapon, throwing it to keep an opponent at bay. But there are various exercises: Mayweather shadowboxes with small hand weights. Rocky Marciano used to shadowbox in neck-high water in a swimming pool. There’s the “Olympic Drill.” With 10 or so seconds left in each round stand still and ( with good form ) throw punches non-stop at the heavy bag. Most timers like the ones sold in boxing equip catalogs have a whistle to indicate time left in the round. Being stiff and tight is exactly my problem. I’m a boxingfan who started training at age 27 and I’m really surprised about how difficult it is to relax between the punch exchanges. You can’t really compare the fear of getting KO’d with the fear of losing a e.g. tennis match. It’s a completely different mind game. Martin: The majority of boxers, even veterans, have problems relaxing in the ring. But notice that all of the elite fighters such as Mayweather, Hopkins, and even moreso: Ali, Leonard, Duran, had it down. I believe it is something that our nervous systems are NOT programmed to do. 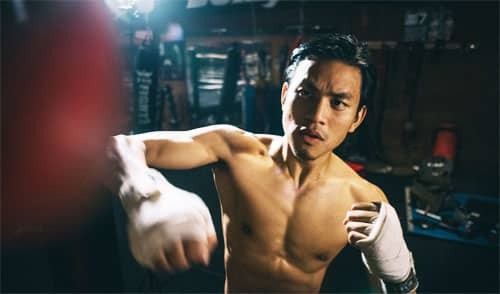 So, it is something that you must work on and practice at all times, when running, shadowboxing, hitting the mitts, the bags, sparring, and so forth. The fear of getting hit with big shots is just part of it all, but with consisitency you do become callused. This is why the top guys almost all started a a very young age. When the punches are coming is when to remain calm and do your best not to get emotional while looking for your counterpunch. Again, though, a loose fighter often automatically but also by practice, learns to roll with and take the shock out of punches. This is a very high level of defense, but it is also extremely important. Again, most guys never master it. But to be truly successful and have longevity in your boxing, it MUST be learned. Did you watch Luis Ortiz against Bryant Jennings last week? Admirable it was to see him relax between the punch exchanges. If you seriously want a Belt. If that is your dream or goal in life and believe you truly can do it. I held 3 at one stage of my career. Yes everything your taught, read or worked out yourself is crucial. Only Practice will make Perfection. One thing that will separate you and a Belt is DON’T be scared to be Punched. Fear is something that cannot even be emotive. Johny I enjoy the way you explain harder to execute Techniques, etc in a positive way. But, If getting Punched in the ring is something you fear and that is the worse fear you have. Do Boxing cause you Love it and the fantastic fitness it gives you. An elite Fighter has NO fear. Example (Not myself) Tyson in his Prime had won ever fight by KO/TKO until he went the distance with a Fighter called James Quick Tallis. I’m not from the states but took a Boxer over there and met him. One thing we both had in common and I bet Mike has also. We all had NO fear of been Punched. Look at your Opponent and think How could I fear been Punched by him. I feared the time my Father beat me, the time I was in jail and feared the unknown, Fight’s as a kid on the street, after that car accident, etc, etc. He/She Is just another Human Being. Might move better, bullet fists and massive power but never have Fear them. Fear does everything your told your not to do. Enjoy every moment in the ring. It’s a great sport but you cannot have Fear. Talent will only take you so far. If you want to fight in front of 80,000 plus people without fear you have already began to beat your opponent. You are so right. The biggest issue I have when training people is that they cannot relax or they are trying to punch threw walls. It makes a huge difference. Good article. I read your site pretty much daily. I love it. Keep it up. Nice article Johnny, keep it up! I think that jumprope and shadowboxing should be involved in more gyms. this really helped me. I live in a very small city, thus can’t join a boxing gym. Should I start with a punching bag. Very encouraging. My arms get tired way too soon. I just bought a heavy bag and will do exactly as you say. Being relaxed has got to be the key, I tried everything else! Keep up the good work Johny. Johnny – though heavy weights is not good for a boxer, what about some light weight exercises with high reps that target shoulders?? Wanted to thank you for your article about how to increase arms endurance, it 100% works, since you posted it I started doing those 30 second drills on the heavy bag, started working with double end bag and hit higher on the bag, jump rope tricks etc. and it works just GREAT! today I sparred and I could just throw that jab endlessly. 🙂 thanks man, really! I am interested in counter punching drills and counter punching on the Blackfoot. I have ordered your advanced footwork drills dancers. I have a golden gloves champion as a son and looking at new training techniques to up his game new season. johnny, espero puedas traducir este mensaje, soy de Argentina, Buenos Aires. Es verdaderamente util y sirve de mucho a la gente que nos gusta el boxeo, al menos como aficionado en mi caso, te agradezco mucho tu trabajo, es fuente iniciadora de mi en el deporte tan maravilloso del boxeo. Ojala siguieran traduciendo para la pagina expertboxing.es, ya que no manejo otro idioma como veras. De todas maneras muy agradecido por tu experiencia volcada a este medio. Posted the link to the hundreds of fighters that I follow or follow me. Well expressed indeed. No matter how much talent you have a tense Boxer cannot get the job done. I have never thought of been a person that tries to appear relaxed to others. But in actual fact that is exactly what i do. The good fighters that have perfect stance and movement in my Gym’s always look the best. I have always tried to mimic them so unintentionally I’m trying to look like them thus be relaxed. The relaxed and calm appearing Fighters also appear to me as the ones that have a great looking style. Hence the successful ones. Keep Punching. Really love the tip of letting my fists return naturally. A great speed exercise is to try to punch without seeing your fists. Try to be soft and let your joints do the work. Got a floor to ceiling bag last week. It’s already giving me more hand and foot speed and I’m able to move my head a lot better. I’m no ones idea of a good boxer but if you don’t have a floor to ceiling please consider it.